These things are great! They hold onto the gel, but don't soak it up. Seem durable, should last awhile. Nice to have some what of a handle on an applicator.Unlike the round ones. 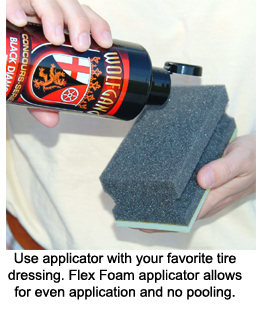 Perfect tool for applying tire shine. Just what I needed , a big applicator with a nice big handle to hold on to. I've been using these for years and they serve the purpose better than anything I've found (or used, such as old rags). They last a good long time (a year or so), only really needing replacement when the backing separates from the foam. This takes a long time, though. 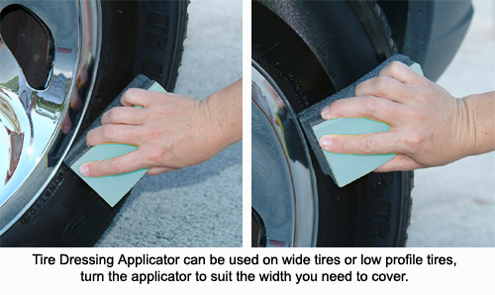 They make it easy to evenly apply the dressing and to work around the edge of the rim without getting the tire dressing on the rim. Good stuff!